Making America Great Again and coming to a really big screen in TC. 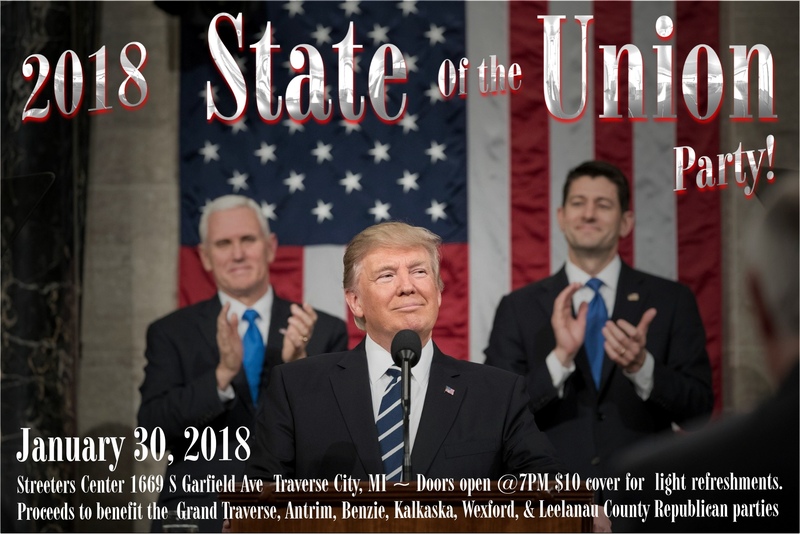 January 30 will be the State of the Union given by the guy who has pulled the pants down on the praetorian guard for the Democrats party. The state of the nation is certainly the best it has been in the past eight years, and probably going much further back when looking at the rollback of the federal regulatory clime. Add to this tax reform that begins the simplification of the code, and a bureaucracy that will be more friendly to the individual and aspiring entrepreneurs. Judges, walls, and a return to international respect through proper foreign policy etc., all of which has been accomplished in only a single year with the Donald as the CEO of USA inc. In Traverse City, we will be having a party. 10 Bux. Snacks provided, and drinks are on the guy next to you. (he/she will be looking your way) Proceeds will be distributed to the local county GOP parties as we wind up for a busy election year.